Posted: January 14, 2017 Updated: January 14, 2017 by onlineph | Filed under Business, Government, Public Service, Technology, Tutorials, Videos. Aside from the low cost of e-bikes, which ranges from Php 13,000 to Php 30,000, another key selling point that dealers use to sell these bikes is that you do not need to have a license to drive one. Apparently, this claim isn’t true as LTO clarifies that just like any other motor vehicle that drives through our roads, it is necessary to have e-bikes registered and the rider possessing the permits at all times while using it. 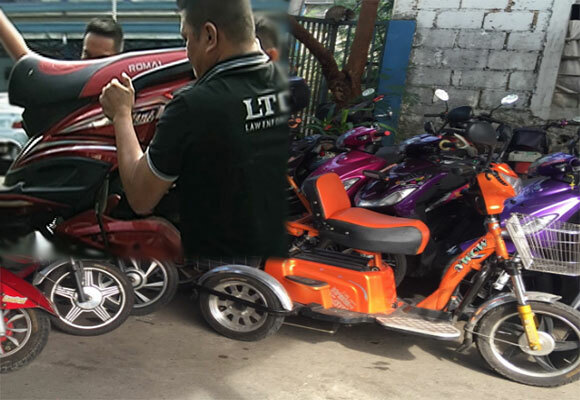 Just this week, the agency confiscated some unregistered e-bikes along EDSA, Commonwealth Avenue and Pasay City. LTO is also looking into having some talks with e-bike sellers to inform them of the protocol. The next step is to proceed to the transaction counters and submit your complete documents to the Evaluator for evaluation and computation of fees. Afterwards, your vehicle will be inspected with the duly accomplished MVIR. After you passed the inspection, you would proceed to the cashier to pay necessary fees and obtain your Official Receipt. Lastly, proceed to the Releasing Counter to obtain your Certificate of Registration, plates, stickers, and other requested documents. Do not wait until your E-bike has been impounded. If you were caught driving without registration you need 10,000 pesos to redeem and will not be allowed to get student license permit for the whole year.